We Veggie Runners are full of the Blitz spirit. We’re all about make do and mend, waste not, want not and putting a few stitches in our lucky race knickers so we don’t have to buy new ones. We’re the same with food. Why make one meal when you can stretch it out to two, three or even four? Having your dinner ready made leaves more time for running and/or washing your sweaty race kit too. Win-win, which you know we love. This dish starts out as a tasty vegan risotto using seasonal vegetables and ends up as delicious risotto cakes to serve with a crisp salad or steamed veg. It’s inspired by Ottolenghi’s Brussels Sprout Risotto, in that it also uses Brussels sprouts, but the resemblance ends there, really. We’ve made a vegan variation, ditching cheese for nutritional yeast, used different vegetables and added beans for extra protein. 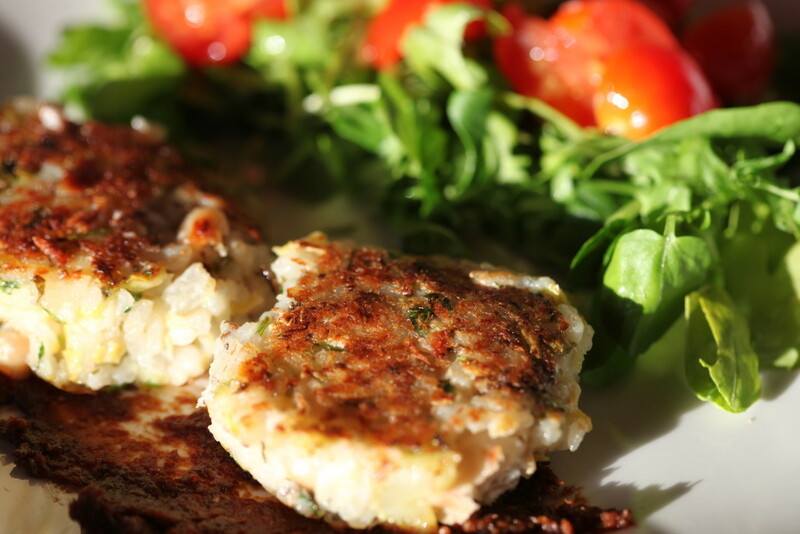 There are chia seeds in the risotto cakes too to bind them and boost your protein intake even further. If you’re really clever, you’ll have the risotto for carb loading the night before a race and the risotto cakes after the run for recovery. Over a medium heat, warm the olive oil and gently saute the onion for 10 minutes, stirring occasionally. Add the garlic, lemon zest and marjoram and cook for another couple of minutes. Stir in the rice and Brussels sprouts, coating the ingredients well with the olive oil. Add the white wine, if using. Stir well and then start slowly adding the stock. Add the stock a little at a time, stirring well each time until the stock is absorbed. When all of the stock is absorbed and the rice is cooked, remove from the heat and stir in the nutritional yeast and add salt and pepper to taste. Soak the chia seeds in the water for about 15 minutes. Crush some of the beans then mix all of them (the whole and the crushed beans) into the risotto. Add the soaked chia seeds and mix well. Form the risotto into balls and flatten into patties. Heat the oil in a shallow frying pan and fry the risotto cakes until crisp and golden, ensuring that they're heated all the way through.